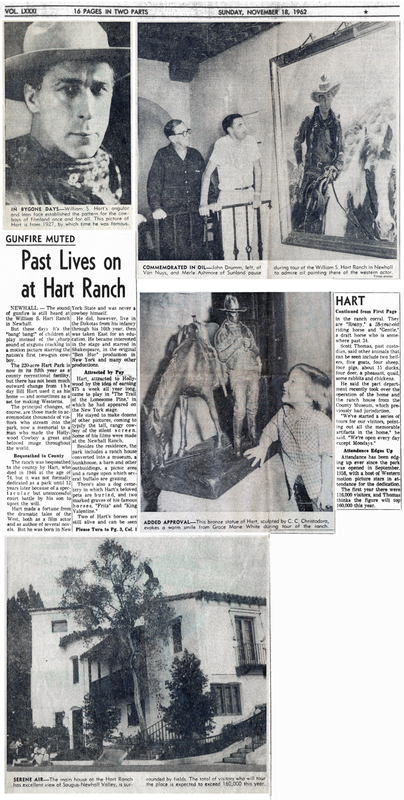 SCVHistory.com | William S. Hart Park | Past Lives On at Hart Ranch | L.A. Times, 11-18-1962. Past Lives On at Hart Ranch. Los Angeles Times | November 18, 1962. Newhall — The sound of gunfire is still heard at the William S. Hart Ranch in Newhall. But these days it's the "bang! bang!" of children at play instead of the sharp sound of sixguns cracking in a motion picture starring the nation's first two-gun cowboy. The 220-acre Hart Park is now in its fifth year as a county recreational facility, but there has not been much outward change from the day Bill Hart used it as his home — and sometimes as a set for making Westerns. The principal changes, of course, are those made to accommodate thousands of visitors who stream into the park, now a memorial to a man who made the Hollywood Cowboy a great and beloved image throughout the world. The ranch was bequeathed to the county by Hart, who died in 1946 at the age of 74 [sic: 81], but it was not formally dedicated as a park until 12 years later because of a spectacular but unsuccessful court battle by his son to upset the will. Hart made a fortune from the dramatic tales of the West, both as a film actor and as author of several novels. But he was born In New York State and was never a cowboy himself. He did, however, live in the Dakotas from his infancy through his 16th year, then was taken East for an education. He became interested in the stage and starred in Shakespeare, in the original "Ben Hur" production in New York and many other productions. Hart, attracted to Hollywood by the idea of earning $75 a week all year long, came to play in "The Trail of the Lonesome Pine," in which he had appeared on the New York stage. He stayed to make dozens of other pictures, coming to typify the tall, rangy cowboy of the silent screen. Some of his films were made at the Newhall Ranch. Besides the residence, the park includes a ranch house converted into a museum, a bunkhouse. a barn and other outbuildings, a picnic area and a range upon which several buffalo are grazing. There's also a dog cemetery in which Hart's beloved pets are buried, and two marked graves of his famous horses, "Fritz" and "King Valentine." Two of Hart's horses are still alive and can be seen in the ranch corral. They are "Roany," a 38-year-old riding horse, and "Gentle," a draft horse who is somewhere past 34. Scott Thomas, past custodian, said other animals that can be seen include two heifers, five goats, four sheep, four pigs, about 15 ducks, four deer, a pheasant, quail, some rabbits and chickens. He said the (park) department recently took over the operation of the home and the ranch house from the County Museum, which previously had jurisdiction. "We've started a series of tours for our visitors, pointing out all the memorable artifacts in the home," he said. "We're open every day except Mondays." Attendance has been edging up ever since the park was opened in September, 1958, with a host of Western motion picture stars in attendance for the dedication. The first year there were 116,000 visitors, and Thomas thinks the figure will top 160,000 this year. Original newspaper clippings of photos from collection of Harold G. Deines, courtesy of Myrna Litt and B.J. Atkins.